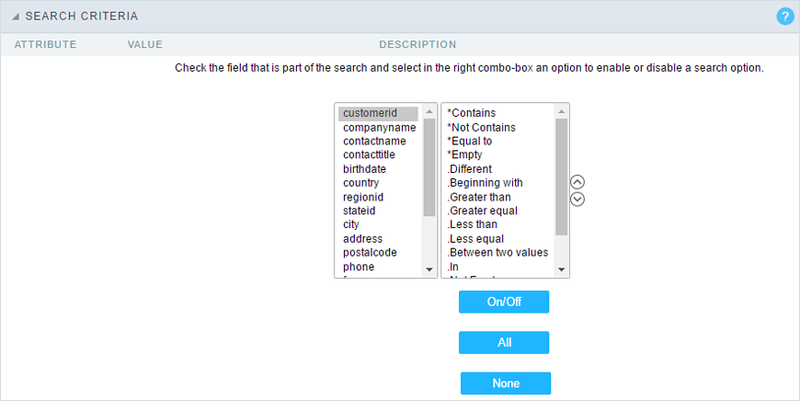 This interface has the options for you to select and set the Search aplication required fields. 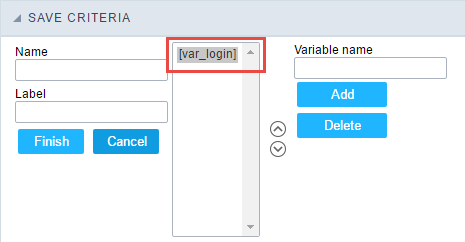 Within the generated application will be displayed a marker(*) next to the field and an error message will also pops up if there’s no value assigned to the mandatory fields. You will be able to set some options for the market using the options below. Marker position : Marker’s position relative to the field (options are right, left or Do not display). Display message : Displays whether or not the validation error message. 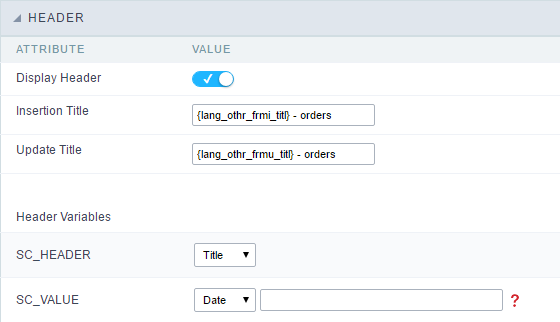 In this interface, you can configure the conditions for each field of the Search form when filtering the SQL, on the left combo is displayed the field. The combo on the right are listed the options for filtering the selected field, to select the options just click on them (Equal to, Beginning with, Contains and etc.) and the button On/Off. The arrows on the right allows to alter the order of the fields. 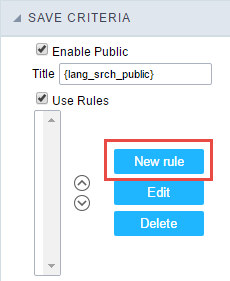 For the Date type fields, you can define special conditions for the search, accessing the field configurations and editing the Special Conditions Settings. On/Off : Enables or disables the field or the selected option. All : Marks all fields or options. None : Un marks all the fields or options. 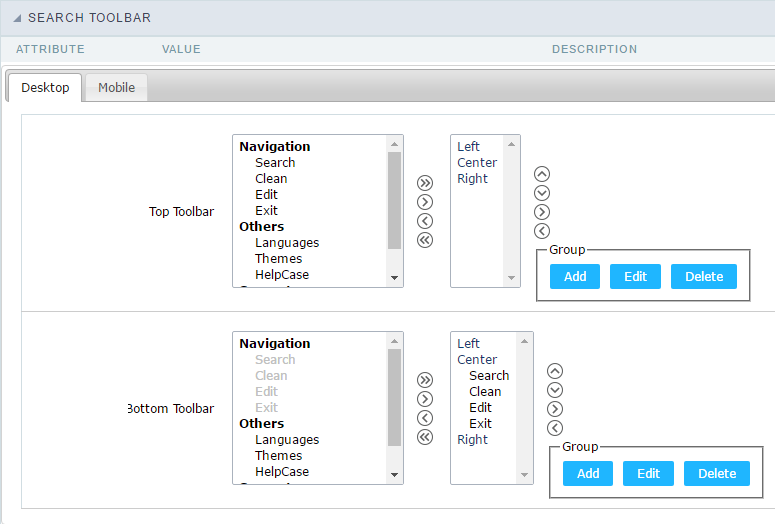 The Search toolbar is divided in two parts: Top and Bottom, in a way that is possible to define the buttons that will be displayed in both bars. The selection of buttons in the top and bottom toolbar works independently, allowing the buttons to be displayed in both bars at the same time. Navigation: Groups the options relative to the navigation buttons that can be displayed in the application. Clean: Clean the all the search fields. Edit: Enable the Save Tag option. Others: Groups a diversity of options relative to the application. Languages: Displays a combobox with the names available, defined in the project properties. Themes: Displays a combobox with the themes available, defined in the project properties. HelpCase: Displays a button to redirect to the help page. —————–: Dispays a line separating the buttons, when used the Group Buttons. Use in-line buttons: Allows the alignment of the filter buttons next to the fields. __ Inline buttons__: Allows you to select which buttons will be displayed next to the field, and you can sort them according to your wishes. This option is available by enabling Use Online Buttons in the button settings. Hotkey: Allows you to set keyboard hotkeys to a button. Use Inline Buttons: Allows alignment of the filter buttons next to the fields. Position of the in-line buttons: Sets the positioning of the buttons to the right or left of the fields. 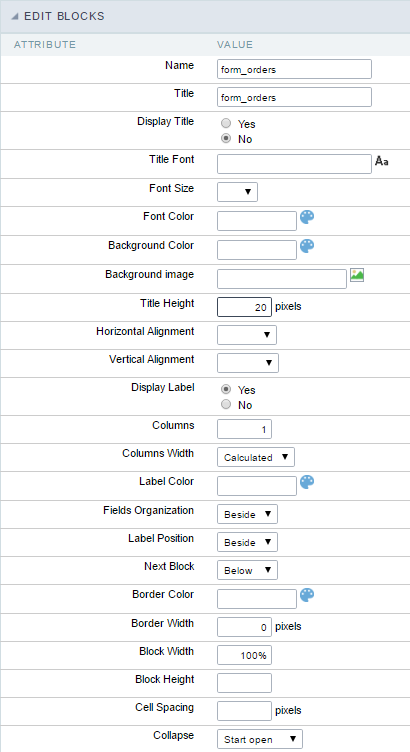 Column Quantity: Sets the number of display columns of the buttons, allowing you to configure whether they will be displayed side-by-side or distributed in columns. Button Position(Top/Bottom) Positioning the buttons of the toolbar Top/Bottom. This feature allows to organize search profiles, it creates an option Save Filter in a Search application, this way it is possible to save the search done previously. You can add some rules. With these details you can save a search done by the user login. This feature allows to organize search profiles for the tags, it creates an option Save Filter in a Search application, this way it is possible to save the search done previously. You can add a name. With this name you can save a search done by the user login. Conceptually a block is a “container” where you can position the fields of the Applications: Form, Control or Grid with Slide orientation. By default, the applications created in ScriptCase are built with a only one block, with the same name as the application. You can add the amount of blocks that you want to organize in a more convenient way. The page below, observe that theirs a column Organization, and that is where you’ll define if the next block will be set beside or below the current one. On the left side of each block there are two icons, first has the function to edit all the information relative to the block and the second is to delete the block. See below how to modify the display order of the Blocks in one Page. Click and drag the block that you desire to modify to its new position. Click on the block desired and drag it to the item “Blocks not Shown”. This way, you can also drag the block to another page if desired. See the images below. Name : Name of the Block. Label : Title of the block that’ll be displayed in the application. Display : Flag that controls the title display of the block. 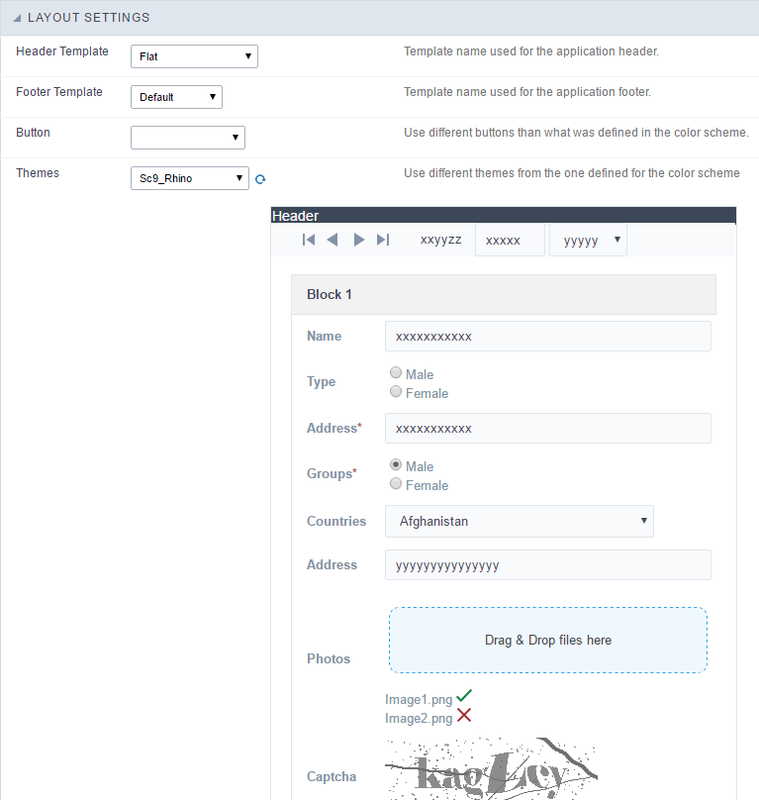 Display : Flag that controls id the label of the fields will be displayed in the block. Above : The label will be displayed above the field. Beside : The label will be displayed beside the field. Below : The label will be displayed below the field. Columns : Amount of columns that are displayed side by side in the block. Below : The fields are displayed one below the other respecting the amount of columns. Beside : The fields are displayed one beside the other respecting the amount of columns. Line : The fields are displayed one beside the other without the tabulation. Below : Indicates that the next block will be placed below the current one. Beside : Indicates that the next block will be placed beside the current one. Tabs : Indicates that the next block will be placed in a different tab then the current one. Width : Specifies the width that block will occupy in pixels or percentage, in case the value is in percentage, inform the (%). Collapse : Enables the option to close the block. To include new blocks in an Application, click on the button . Next, you’ll see the following interface to define the name and label of the block. At the end click on Create. To edit a block just click on the icon , that is on the left side of the block. Next, you’ll see the following interface to define the parameters of the blocks. At the end click on save. Title : Block title for display. Display Title : This option, when active, allows to display the block title. Title Font : Font applied to the block title. Font Size : Size of the font applied to the block title. Font Color : Font color for the block title. Background Color : Background Color of the block title. Background image : Background image for the block title. Title Height : Height in pixels of the block title line. Horizontal Alignment : Horizontal Alignment of the block title (Left, Center and Right). Vertical Alignment : Vertical Alignment the block title (Top, Middle and Bottom). Display Label : Display the labels of the fields in the block. Columns : Amount of field columns in a block. Columns Width : How the width of the block is defined. Label Color : Color of the field labels. Fields Organization : How the fields are organized in the block. Label Position : Position of the field labels relating to the data. Next Block : Position of the next block relating to the current block. Border Color : Border color for the block. Border Width : Border Width for the block. Block Width : Width for the block. Block Height : Height for the block. Cell Spacing : Cell Spacing in the block. On this module are available the features of editing, attributes and display of the application, in a way that you can apply display themes, organize blocks, define values and the format of the Header/Footer and etc. On this interface, you can define the theme for display of a specific application, this being because ScriptCase uses a Standard Definition of Values per project, that besides the Display Theme, allows to define values for other attributes on a Project level. Header Template : Allows to choose the template that’s going to be used as the Header of the application. Footer Template : Allows to choose the template that’s going to be used as the Footer of the application. Button : Allows to choose the button theme for the application. Themes : Choose one of the existing themes, it’ll load the display mode (colors ,fonts, etc.) that’ll be part of the application. In this block, it’s the definition of the variables content that’ll be part of the header. This page may change depending on the header format chosen in the Layout Settings. Display Header : This option determines if the header will display. Title : Allows to inform the title displayed in the application. Field : When you choose the option “Field”, it’ll open a Combo box beside to choose the field you want. 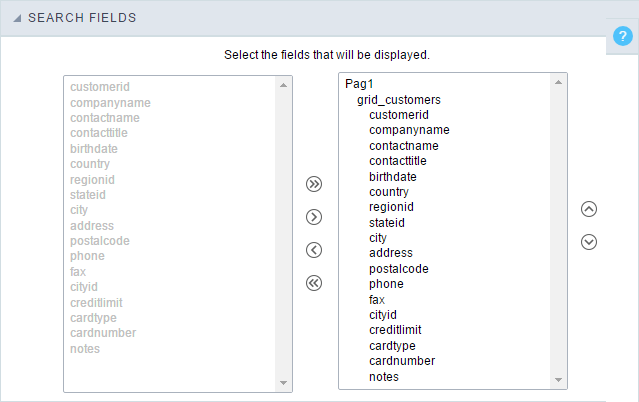 Selecting the desired field, it’ll associate the value of the field with the header. Title : This option when selected it’ll display in the header the value informed in the “Application Title”. Date : When selected the “Date” type, it’ll display the system’s date in the header. There are a diversity of formats using the date and time of the server. The format can be informed in the text field that appears beside the field. To access the existing formats, click on the icon and you’ll view a page display the formats. Image : When selecting the image type, it displays a field to inform the name of the existing image in the server. To locate the images existing and selecting one, click the icon “Choose Image” and to upload new images click on the button “Upload” . Value : When selecting the type “Value”, the content informed in the text field that appears beside, it’ll be displayed in the header, you can inform texts and “Global Variables”. e.g. “Employee Name: [v_name]”. Depending on the Application, you may have more than one title option. This page may change depending on the footer format chosen in the Layout Settings. Display Footer : This option determines if the footer will display. Field : When you choose the option “Field”, it’ll open a Combo box beside to choose the field you want. 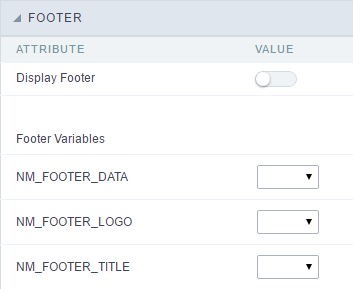 Selecting the desired field, it’ll associate the value of the field with the footer. Date : When selected the “Date” type, it’ll display the system’s date in the footer. There are a diversity of formats using the date and time of the server. The format can be informed in the text field that appears beside the field. To access the existing formats, click on the icon and you’ll view a page display the formats. Value : When selecting the type “Value”, the content informed in the text field that appears beside, it’ll be displayed in the footer, you can inform texts and “Global Variables”. e.g. “Employee Name: [v_name]”.